Jerry Lewis must have driven the studio bosses to drink when he announced that he wanted to tamper with his proven formula for The Nutty Professor. For the first time in his career, the funnyman set aside his recognized “kid” persona, creating an entirely new character with a different voice, different posture, and different look. The film was different as well. 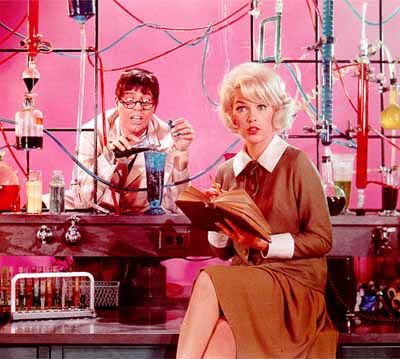 Instead of a loosely connected group of blackout gags, The Nutty Professor featured a storyline that was both more coherent and more adult than anything Lewis had previously directed. Jerry portrays Julius Kelp, a buck-toothed, near-sighted, accident-prone science professor. Kelp is smitten with Stella Purdy (Stella Stevens), a curvaceous undergrad, but he is too timid to approach her. After being humiliated by a bully in front of Stella and the rest of his class, the professor decides to bulk up, but physical exercise fails to improve his physique. His only other option is chemistry, and before you can say “Jekyll and Hyde,” Kelp whips up a potent cocktail that transforms the nerdy academic into Buddy Love, a conceited, ill-mannered lothario. Despite his bad behavior, Buddy sweeps Stella off her feet and becomes the idol of the collegiate set, who adore him for his singin’, swingin’, and swillin’. Of course, the charade can only last so long. 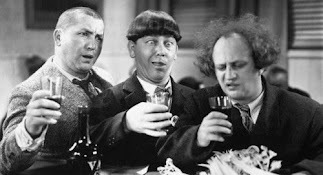 Over the years, The Nutty Professor has become Lewis’ most celebrated film, but few critics have noted the major role that alcohol plays in the narrative. Once the professor transforms into Buddy Love, he becomes a big-time boozer, leading to two of the best-remembered scenes in the history of soused cinema. The first occurs immediately after the professor’s initial transformation into Buddy Love. Kelp’s newly released alter ego makes a beeline for the local watering hole, The Purple Pit, a popular hangout for Stella and the other college students (most of who appear to be in their mid-forties). Buddy wastes no time in ordering a drink, the “Alaskan Polar Bear Heater,” a beverage of near-lethal potency. 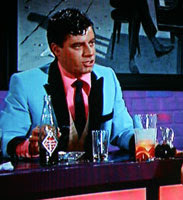 After dictating the cocktail recipe to the Purple Pit’s bartender (Buddy Lester), he allows the mixologist to take a sip of the dangerous drink. The bartender finds the concoction palatable, but then freezes in place as if stricken by Medusa. Buddy is unfazed and has no qualms about downing the rest of the cocktail. The Nutty Professor also contains the single greatest hangover scene of all time. Showing up late for class, wearing tinted glasses, Professor Kelp suffers the aftermath of Buddy’s bacchanalia. Lewis amplifies every sound in the scene to allow the audience to experience what the character is going through. As he shuts the classroom door, the accompanying slam sounds like a cannon shot; chalk rubbing against the blackboard sounds like the scraping of metal upon metal; and liquid dripping into a test tube sounds like the beating of a kettle drum mixed with the crashing of waves upon the shore. It is an inspired scene--the best in the entire film. While The Nutty Professor isn’t the funniest film Jerry Lewis ever made, it’s probably his best all around film. Like all of the movies directed by the comedian, the jokes are uneven and the story occasionally descends into sappy sentimentality. At the same time, Jerry’s gifts as a filmmaker were never displayed to greater effect. From the bizarre transformation scene to the lovely close-ups that display Stella Stevens at her yummiest, this film is a candy-colored delight. Potent Quotables--BUDDY LOVE: I’ve decided that I shall not continue the flight on the gas I got, so give me a boilermaker, and heavy on the boil. Video Availability--The Nutty Professor is available as both a stand-alone DVD or as part of the Jerry Lewis: The Legendary Jerry Collection (Paramount). Similarly Sauced Cinema-- Daffy Duck and Bob Hope encountered drinks of “Alaskan Polar Bear Heater”-type potency in Drip-Along Daffy (1951) and Son of Paleface (1952).